Far-left activists protesting deportation of illegal immigrants surround Justice Minister, call her 'murderer'. Far-left activists opposed to the planned deportation of more than 40,000 illegal immigrants living in Israel confronted Justice Minister Ayelet Shaked (Jewish Home) Thursday afternoon, surrounding her as she visited south Tel Aviv while hurling epithets. The incident occurred during Shaked’s visit to the Shapira neighborhood in south Tel Aviv, one of several neighborhoods in the area that has become home to a significant illegal immigrant population over the past few years. Following a meeting with Justice Ministry employees who were visiting south Tel Aviv Thursday to observe the situation there firsthand, Shaked was confronted by a group of radical far-left activists who surrounded the Justice Minister as she left the meeting and headed to her car. Armed with bullhorns, the activists called the deportation order “racist” and “fascistic”, and accused Shaked of “promoting hatred”. Some activists called the minister a “murderer” and a “coward”. Shortly afterwards, Shaked posted a recording of the incident on Twitter, remarking that most of the activists weren’t even residents of the neighborhood in question. Over the past decade, some 60,000 illegal immigrants managed to cross into Israel over the Egypt-Israel frontier in the south. The infiltrators, mostly nationals of countries in northeast Africa like Sudan, Somalia, and Eritrea, settled across Israel, concentrating in south Tel Aviv, with smaller populations in Eilat, Ramat Gan, Bnei Brak, Ashdod, and other cities in the coastal plain. A security fence built on Israel’s border with Egypt ended the flow of illegal immigration by 2013, and more than 15,000 infiltrators were repatriated under a voluntary self-deportation program established by the Netanyahu government in 2014, which offered cash payments to those who left willingly. Yet more than 40,000 illegal immigrants still remain in Israel, mostly in south Tel Aviv. In August 2017, a scheme to forcibly deport the remaining infiltrators was blocked by the Supreme Court in August, when justices ruled that the agreements in place with the African nations receiving the illegal immigrants specifically stipulated that the countries would only accept migrants who leave Israel voluntarily. By October, however, the Netanyahu government had secured the backing of several unnamed African countries to receive illegal immigrants expelled from Israel, allowing the deportation plan to move forward and circumvent the court’s objections. In December, the Knesset voted 71 to 41 on a bill which, among other things, approved the deportation plan and the closure of the Holot detention facility, home to close to 2,000 illegal immigrants awaiting deportation. 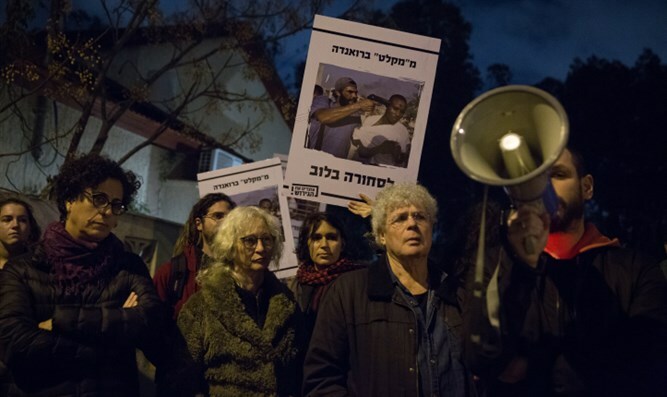 The deportation program, welcomed by many residents of south Tel Aviv and the coalition government, has been decried by left-wing activists who deny claims by locals that illegal immigration has had a severe negative impact on their neighborhoods. Activists have also claimed that many illegal immigrants, who were eligible for the draft in their countries of origin, could not be safely returned home, and should be considered for refugee status.